We now offer Raindrop Technique to enhance your massage experience. Raindrop Technique combines conventional massage techniques, a form of Oriental acupressure, and Vitaflex (Reflexology). This soothing therapy can have a positive effect on both your body and your spirit. Raindrop Technique uses pure therapeutic-grade essential oils that are organically grown. 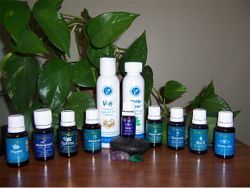 The Young Living Company makes the essential oils - seven single oils (Basil, Birch, Cypress, Marjoram, Oregano, Peppermint, and Thyme) as well as three blended oils (Valor, Aroma Seiz, & Ortho Ease) that are used in Raindrop Technique. These oils are dropped onto the body, along the spine, like gentle raindrops. After the oils are applied, Pat uses a special stroking technique to spread the oils. A warm towel is then laid on the back for a short period of time, aiding in the body's absorption of the oils. The same oils are used on the Vitaflex points on the foot, especially on the spinal points. The Raindrop Technique is different from traditional Reflexology and Back Massage in that there is no heavy pressure used; the gentle action of the oils brings about the beneficial results. The oils continue to work for hours after the treatment, continuing their beneficial action. Our clients have reported feelings ranging from total relaxation, emotional release, to feeling zestful energy following a Raindrop Technique session. We offer Raindrop Technique, plus Raindrop Technique with deep tissue work, and urge you to call today to experience this special therapy.